Back in February, when I presented at the Ed Tech Teacher iPad Summit in San Diego, I had the pleasure of meeting some of the team from Tangible Play. As a grade one teacher their table stood out from the other vendors. Instead of information pamphlets and business cards, there were letter tiles, tangram pieces, play dough and coloured markers. Some how those hands-on tools (which my young learners enjoy working with) were used in conjunction with an iPad. I had to find out more. I asked a ton of questions and Karen O'Dell shared a lot with me but more than anything I wanted my students to have the opportunity to try the product out. Karen made it happen. 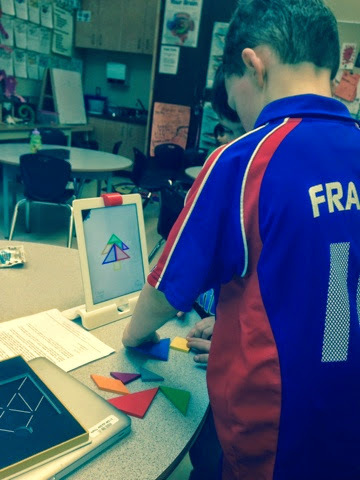 When Osmo arrived Tangram was the first app we looked at. I shared it with a couple of students and instantly they were hooked. It was really quite wonderful to listen to how they were talking and problem solving together. To no surprise the rest of the class wanted in so we put it under the document camera and one at a time children came and added pieces to the puzzle. Knowing that with a class of 24 students, more than two would have to work with it at any given moment, my students figured that six was a good number and they happily problem solved in sixes. Tangram became a choice activity during "free choice" and was also integrated into our math time. During other times of the day it was pulled out to give students a break. It was always in use. The Tangram app itself has changed a fair bit over the beta testing period. 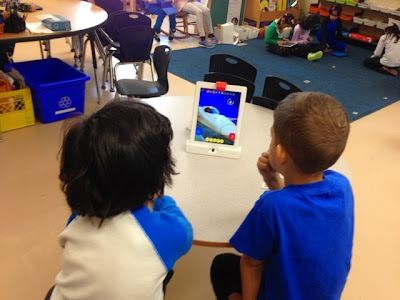 Tangible Play (the makers of Osmo) have been extremely receptive to feedback. There are many levels/challenges with the images that students are trying to replicate with their tangram pieces. At first the images on the iPad are full colour outlining the shapes, but quickly the shapes become grey in colour, then the outline of the tangram pieces disappear. My students chose to try more challenging puzzles or to work where they are most comfortable. That's one thing I love about the app. It doesn't expect every one to work at the same level. It's really easy to clean up too. My students just have to return the pieces to the clearly marked spots in the box. Words was introduced next. In Words an image is shown on the screen with circles to make the missing letters for the word. Sometimes only the first letter is missing, some times a few letters are missing, and quickly all the letters are missing. Apparently it changes levels as you play. I think you may even be able to select your level but we haven't explored there yet. There are also two sets of letters. You put your "letter guess" in front of the iPad and the letter either helps complete a word, or it goes to the top. You are allowed only so many "wrong" guesses before the app finally reveals the word. For each correct guess you are awarded points. Originally the app could only be played in competition mode but it was since been modified and a cooperative mode has been added. My students typically just use the cooperative mode and work together. They get so excited when they achieve the 100 points together. When I watched the promotional video (see below) I noticed that they had students throw letters down at the same time. In my class my students take turns adding their letter guesses. I will be honest Words frustrated me a bit when I first started to play with it at home. Often the word it was looking for with the image it was displaying was far too obscure. This feedback was given and like with tangrams the app was tweaked. You can now add your own images and words too (which I haven't explored yet) so it has great potential for word work study while continuing to promote problem solving and cooperation between those who are playing together. Despite my initial reservations my students love this app too! They love guessing the words and trying to figure out what they have to spell. They have been frustrated when the words are too easy, and equally frustrated when the words are too hard. But the app seems to adjust well for them and just like with Tangrams, Words is a popular app during "free choice" time, and word work time. My students choose to use this app often too. This picture totally stumped my students the first time they saw it. The only issues I've had with this app is how long it takes for my students to put away the letters. At first my students were just stacking the letters and putting them back in the box. The problem though was that in the process we lost a letter. We now stack the letters in ABC order, and as bright as my young learners are, finding the letters in order remains a bit of an issue. When time is short I'll direct my students to Tangram or Newton for the shear sake that this app takes a bit longer to clean up. The third and final app I introduced my students to was Newton. In Newton you draw or put down objects in front of the iPad to help redirect a ball to hit a target. What you draw or put down in front of the screen interacts with the balls falling on the screen. By far this is the coolest app. We've only done it using a white board and a white board pen but other beta testers have used all types of objects to redirect the balls. Since my kids are a huge fan of the Where's My Water app by Disney, this works some what similarly as they create the path for the falling balls. 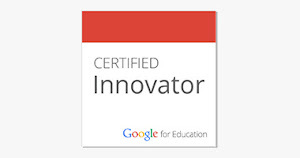 I introduced this app last because I was worried my students would be all over it. 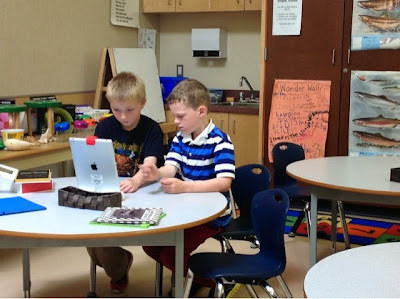 With only one Osmo and 24 students, this is the most difficult of the three apps to share in a large group. Introducing it was easy and to no surprise my students took right to it. I was also extremely fortunate because its introduction corresponded with the arrival of more Osmos in our classroom. At present I have one Osmo for every four students. Again like the first two apps my students loved Newton too. They do find that the groups need to be smaller - remember they have no issue with six for Words or Tangram. Four seems to be the maximum group size for Newton. For some kids this is the app they want to play with all the time, for others they choose Tangram or Words. One of my fears when I first started to Beta test the product was that the novelty of the tool would wear off. It's been a few months now, and we have more Osmos in our classroom, and I still have students who can't always get one when they want one. It isn't a fad app at all, it's here to stay. Another worry is that using the app requires that I remove iPads from their cases. This frightens me a lot in my very active grade one class. 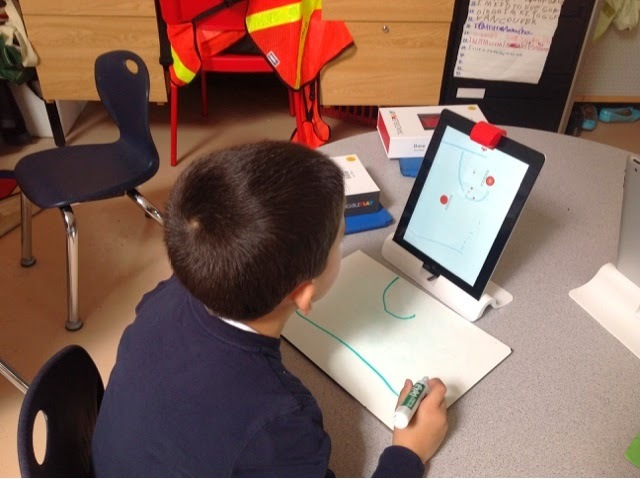 But the Osmo stand is very secure and my students know that the iPads do not travel when they are out of their cases. At clean up time I put the cases back on to ensure that they are on securely. So far this hasn't been an issue. 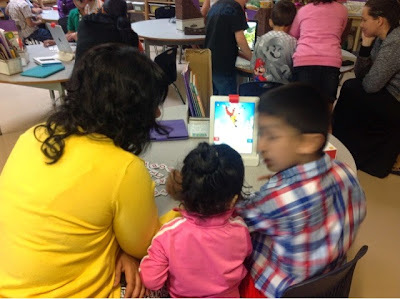 Sharing Osmo with our families. 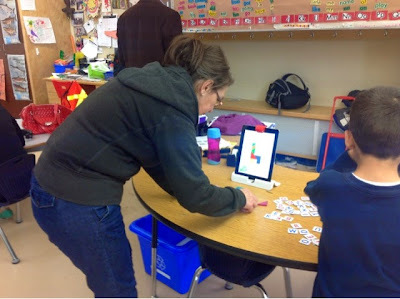 My class and I have also shared Osmo with parents, grand parents, big buddies, and other students in the school. EVERYONE we've shared it with thinks it's really cool and a lot of fun to use. One much younger sibling had more fun throwing the letters at the iPad then trying the Words app. At three though, I'm not surprised. 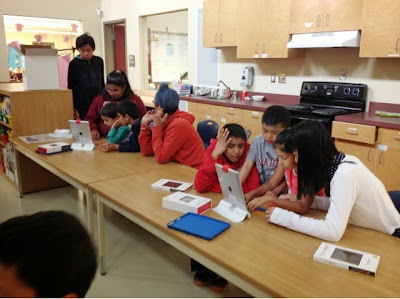 Sharing Osmo with our grade six/seven big buddies. They loved it too! Personally I'd say Tangram is the best app for all ages. I've caught many adults trying to recreate the tangram picture on the screen. I've also seen the young learners giving it a try with success. 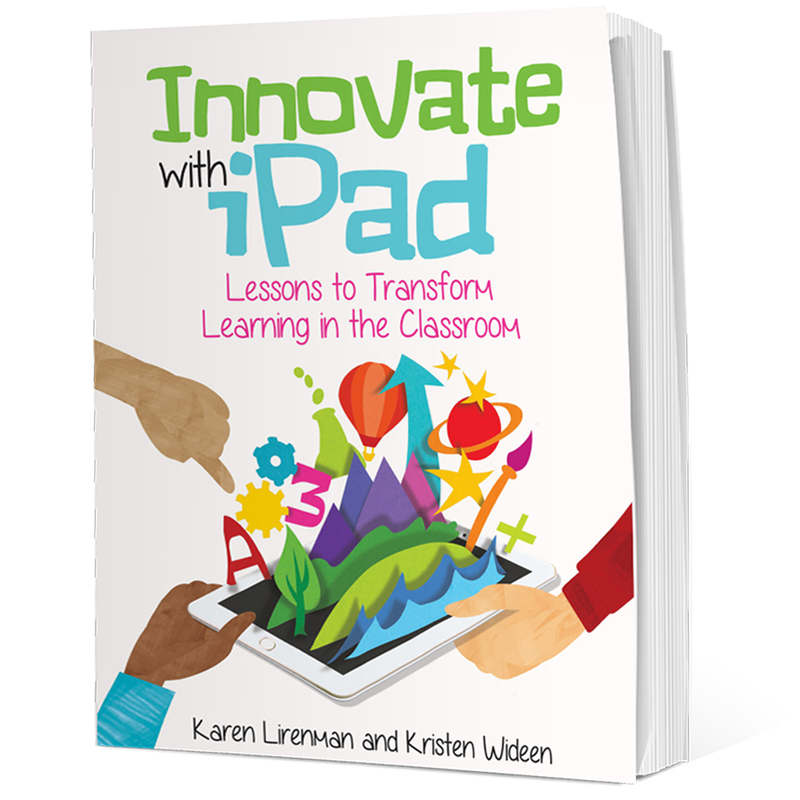 The app meets a variety of learner needs. Show casing our learning using Osmo during student led conferences. 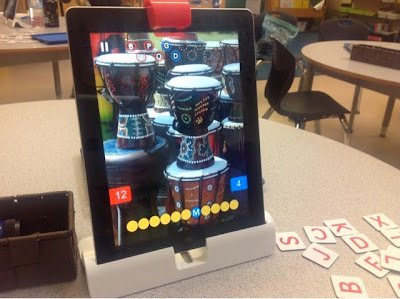 Osmo, with it's bright manipulative hands on tools, has been an excellent addition to my classroom. 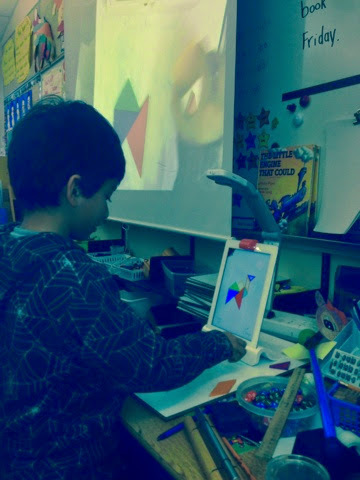 The Tangram, Words, and Newton apps, in conjunction with the hands on tools, immediately engage my young learners. But not only do they engage, they also promote collaboration and critical thinking through the negotiation and problem solving skills that are required to solve the challenges being faced. Osmo is a creative, interactive, fun way to learn. It adds a whole new dimension to working with an iPad. Still curious to find out more, check out this promotional video from Osmo. I smiled when I watched it for the first time. 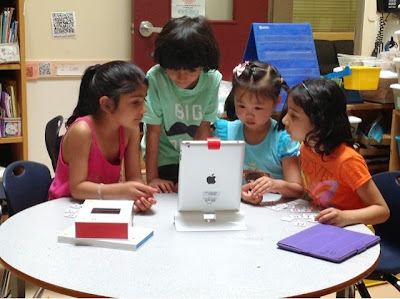 While their video is scripted, it is exactly how my students reacted when they played Osmo for the first time. They were drawn to the product, and immediately started to work together and share ideas as to how to solve the tangram puzzles. Seriously. So how can you get one too? On Wednesday, May 21st Osmo finally went public and pre orders are being taken at 50% off for the next month. You can find out more at playosmo.com . I just bought one and although I haven't recieved it yet, the folks behind the company have been amazingly helpful and quick to respond. That is tops in my books! I can't wait until mine arrives! Excellent review Karen! I have found that having just four set up in different areas of the room has been sufficient for my 20 students. They take turns and pair up. We keep the letter tiles in bowls so they don't have to put them back in boxes each time and I have the stations spread apart so the letter tiles don't get mixed up. My kids used manipulatives with Newton and I loved how they collaborated and problem-solved together. Great ideas Louise. Unfortunately with my class this year I can't leave anything out.